(MoneyWatch) Getting several people on the same phone call is always a bit of a hassle. Most conference-call services require everyone to dial in with lengthy passcodes, for example, and conference-calling software typically requires everyone to have it installed and running. Here's an app that requires neither. 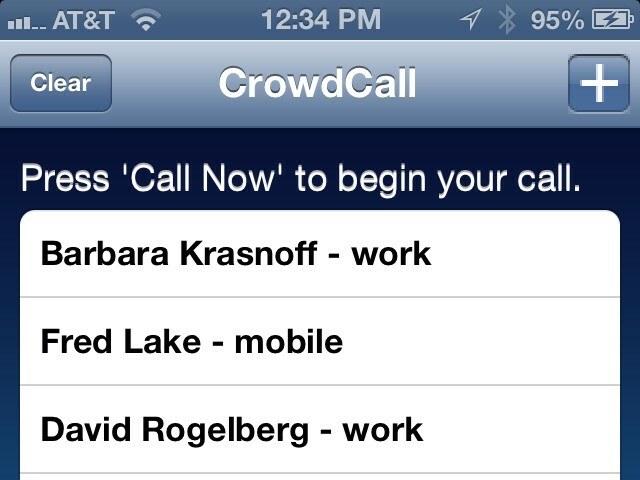 CrowdCall is an iPhone application that makes arranging and participating in conference calls easy and -- at least potentially -- free. Using the app is a snap. The only step in configuring the service is tell the tool your iPhone's phone number. After that, to make a call just add up to 20 attendees from your iPhone contacts list or LinkedIn, or just enter the numbers directly. Then tap "Call Now." CrowdCall will then call your phone, answer it and add other attendees. The call appears to come from your number, so there's no ambiguity about who is calling everyone else. No one has to have any apps installed, nor are there any passcodes to enter. It couldn't be much simpler. Now for the bad news. While CrowdCall is free, you are limited to five 10-minute calls per day unless you pay for extra minutes -- 1,000 minutes costs $10, for example, or you can get 10,000 minutes for $50. Even so, you're limited to 60-minute calls. There's no in-app purchasing, so you need to log into the CrowdCall website to subscribe. Still, it's a pretty slick app. Not only is setting up a call incredibly easy, but you can schedule calls for later and set certain calls as favorites so you don't have to build the attendee list from scratch each time. By contrast, the call quality is somewhat mixed; some calls were as clear as a regular phone call, while others were much lower quality. That might be a consequence of how busy the CrowdCall servers were at any given time of day, or the fault might even have been with other phones on my conference call. Yet quality was still more than sufficient to recommend the service.